Northrise will be able to serve 2000 students by 2020. Phase One is complete and included the dedication and opening of the new 34,000 square foot Campus Center in June 2016. The building is home to faculty, students, and staff and contains a 200 seat auditorium, library, computer lab, cafeteria, and offices. Supporting campus infrastructure including roads, parking lots, and the main campus entrance included in Phase I development were completed in early 2018. Phase Two is scheduled to begin in the fall of 2018 and will include the construction of a new dormitory, two faculty duplexes, alumni house, and additional supporting infrastructure. The new dormitory is the top priority due to growing enrollment and demand for on-campus student housing. 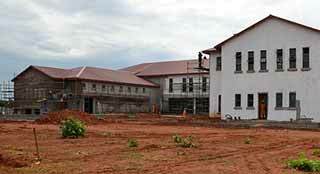 With plenty of land, we only need to build additional facilities to move toward our goal capacity of 2000 students. See the results and meet some of the students that are in our scholarship program.